Syria's Assad: What Forces Can He Count On to Survive? Syria: Is Assad's Clan Turning Against Him? The last time Syrians took on their ruling Baathist regime it was 1982. The protesters then were Islamists from the Muslim Brotherhood and they were not peaceful. Hafez Assad was President. And there was no such thing as a camera phone. Assad mercilessly crushed the revolt in the city of Hama, killing perhaps 10,000 (the exact figure is not known) and, according to local lore, turned one mass grave into a car park, such was his contempt for those who dared defy him. On Monday morning, reports said tanks had rolled into and opened fire in the city Dara'a, the epicenter of the uprising; Syria also closed the nearby border with Jordan. In 2011, Hafez's son and political heir Bashar Assad seems to be following in his father's footsteps, responding to calls for greater freedom with crushing force. Yet Syria 2011 is not Syria 1982. The regime is still ruthless, but this time the rebellion is not restricted to one city or one sect. The constant stream of amateur video spilling over social media is also documenting events  despite the regime's best efforts to smother information by banning journalists  and suggesting that, if there is not a future reckoning, there will at least be a future record. There are other differences. While the father had time on his side (the Hama massacre was preceded by four years of on-off clashes), the son doesn't. The volume of international condemnation is rising, and domestically he may not be able to continue his ferocious crackdown without cracks in his regime or the military. Minor divisions have already surfaced with the weekend resignation of two lawmakers and a mufti from the southern city of Dara'a, where the uprising began more than a month ago. Still, Assad won't lose sleep over the largely symbolic departures. "Threats to the regime can only come from the army and the security services," Ammar Qurabi, head of the National Organization for Human Rights in Syria, told TIME from Cairo. "They will not resign or try to change things because they are the ones committing the massacres." The Assads, both father and son, have appointed co-religionists from their minority Alawite sect to the top positions in the military's brass, ensuring a close-knit protective shield based on kinship and shared interests. When protests erupted in Dara'a in mid-March, for example, it was the 4th Armored Division, led by Bashar's younger brother, Maher, that was deployed to quell the unrest. The fates of many senior officers are closely tied to that of the regime. Still, according to Radwan Ziadeh, a Washington-based Syrian dissident and visiting scholar at the Institute for Middle East Studies at George Washington University, lower-ranking officers are defecting. "They're not following orders," he told TIME. "The regime knows who it can rely on: the 4th and the Presidential Guards. We hope that the military will play a role," he added, "but if senior politicians don't resign, it won't encourage military commanders to do the same." There are at least 15 different security agencies, and so far they are showing few signs of abandoning Assad. But even the Assads' sect may not be fully depended upon. The Alawites comprise no more than 12% of Syria's 22 million people. They hold privileged political and military positions, along with a select group of elites from other sects, spoils they may not wish to risk by keeping the Assads in power, according to a Syrian rights activist in Damascus who requested anonymity. "Many of the Alawites are rich people, they are very well off, but they will have to decide what role they want to play in the future of Syria and if they want to risk it for one family." The secular Baathist regime has long touted itself as the guarantor of the rights of Syria's many minorities, including Christians and Druze. The Assads have wielded an iron fist but have also given the country decades of domestic stability, something a majority of Syrians may be loath to risk, given the country's pre-Baathist history of coups and countercoups. The lack of any clear alternative to the Baathists, given their effectiveness at extinguishing dissent, also makes some Syrians wary of moving too quickly to replace them. State media has helped fuel such concerns by portraying the people on the streets as foreign instigators, criminals and ultraconservative Sunnis  even as government TV, radio and newspapers point out that, among these "dark forces," there is a small legitimate group calling for reforms. It's a view echoed by many of the regime's supporters, like Imad Shueibi, an analyst and president of the Data and Strategic Studies Center in Damascus. 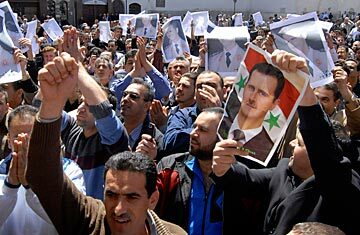 "You cannot say that they are demonstrators for freedom or al-Qaeda or killers only," Shueibi told TIME from the Syrian capital. "They are all of them." It's unclear how many people may share his view. In the meantime, the repression is escalating. Qurabi says his organization has documented "huge numbers" of missing people. "Some went to the mosque for afternoon prayers and never returned, others said they were going shopping and are missing. They're kidnapping people from their homes." More than 120 people have been killed since Friday, according to rights activists, who are calling for an impartial investigation into the deaths. This weekend, mourners burying slain protesters in mass funeral processions were shot at, with at least a dozen reportedly killed. Hundreds of suspected antigovernment protesters were also rounded up in house-to-house raids or nabbed at checkpoints set up around the capital Damascus and in other cities. All this came just days after Assad lifted the almost 50-year state of emergency that mandated such broad security measures. "In Dara'a, which is my city, the security forces aren't trying to disperse the protesters with the use of live fire," Ziadeh claims. "Their aim is to kill them. Some have been killed kilometers away from the site of the protests. They are chasing them through the streets, through the neighborhoods, into their homes." Still, Ziadeh insists that for the most part, the regime's scare tactics aren't working and have just served to embolden protesters. But not all of Syria's cities are completely on board with the protest movement. In fact, the largest city, Aleppo, has been relatively quiet, although there have been several demonstrations at the university and in surrounding suburbs. Analysts say the regime is consciously taking a softer approach to the city, meeting protesters with batons rather than bullets in order to avoid increasing their numbers and hardening their resolve. Still, says Ziadeh, "It's a matter of time," explaining that a combination of fear, the security presence and a large business class intent on stability has kept Aleppo quiet. Joshua Landis, a Syria expert and the director of the Center for Middle East Studies at the University of Oklahoma, says the protesters still don't have the numbers. They "are not there yet," he says. "This is going to be a long battle." See TIME's special report "The Middle East in Revolt."